Heritage Hill is 150 acre farm in North East, MD on the Pennsylvania and Delaware borders. We used to milk, breed and show purebred dairy cattle, Brown Swiss and Holsteins. Debbie became interested in showing dogs after the cattle left, originally starting with Irish Wolfhounds. Don moved on to fixing up and showing antique Oliver tractors. 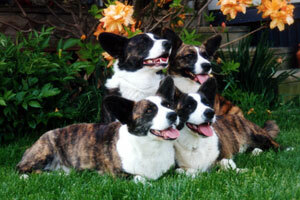 A Cardigan entered our lives in 1990 when I was looking for a smaller breed that had "big dog" temperament. My first Cardigan, CH Bevlyn Tiger Lillie CDX, AX, AXJ was just that and proved to me what a versatile and great breed the Cardigan can be. Lillie is gone now but she produced in me such a love for this breed that I switched my interests entirely to the Cardigan breed and more followed to fill our lives. Over the years I have tried to produce dogs that can do it all; conformation, performance and above all, family pet and companion. We do not have a "kennel", all the dogs are house dogs and family members. I have only one or two litters a year taking care to try to produce dogs that conform to the standard of perfection as much as possible. We adore and take great care of our dogs and try to place our puppies, when available, into families who will do the same.